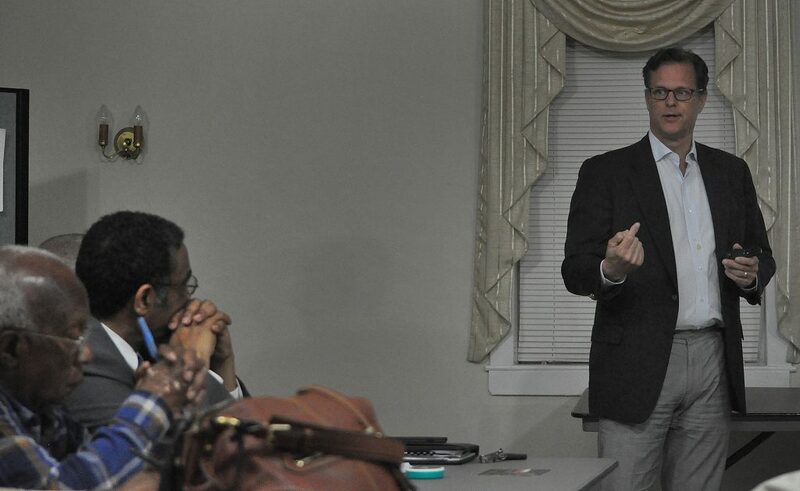 GGP Vice President Doug Adams speaks Monday at the District B Democrats meeting in Calvary Baptist Church. NORWALK, Conn. – Norwalk’s hoped-for mall continues to be a topic in many quarters. District B Democrats on Monday questioned mall developer GGP reps on a variety of issues, from jobs for the locals to a police substation to the possibility that GGP would sell The SoNo Collection before it’s open, while Republican Greg Ehlers told NancyOnNorwalk that he thinks the mall won’t even be built. Ehlers was reacting to Monday’s financial news, as GGP released its quarterly report. 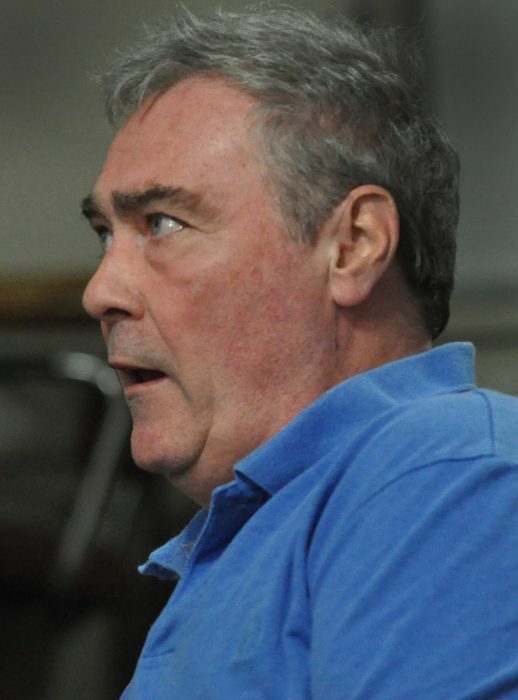 So was South Norwalk resident Rick Reardon, who listened to Monday morning’s conference call with GGP CEO Sandeep Mathrani and questioned GGP Vice President Doug Adams during Monday evening’s meeting in Calvary Baptist Church. Mathrani is quoted in news reports as saying that GGP is looking for “strategic alternatives” and will develop a plan that may include selling assets. “After hitting a post-recession high of $31.97 last July, the firm’s shares have fallen 32 percent, closing April 28 at $21.61, their lowest price in more than three years,” ChicagoBusiness.com reported. “… Though vague, the term ‘strategic alternatives’ is well-understood code in the investment world that includes a sale of some assets or even the entire company. Mathrani didn’t explicitly say GGP was for sale but said nothing to suggest that isn’t an option”. Reardon quoted Mathrani as saying that GGP has $700 million invested in properties in construction, and $600 million in the pipeline. He asked which category Norwalk is in. “Right now, it’s pipeline,” Adams said. “You sold four malls in the pipeline last year. Does this mean we may be in line to be sold as one of the assets?” Reardon asked. “No. I will tell you, if we were to sell this before we complete it, I need to get approval from city of Norwalk,” Adams said. Reardon said that the infrastructure is in place for the West Avenue property, making it a more feasible asset to sell. Others questioned the eventual outcome of the $3.5 million GGP has agreed to pay Norwalk, should the city, through the Common Council, the Redevelopment Agency and the Zoning Commission, agree to let GGP build its mall without a hotel. GGP has submitted a letter explaining what it thinks the money should go toward, Adams said, naming affordable housing, facilities for boys and girls and business incubation. “The problem is it’s not our money. I can’t demand what the city does,” Adams said. State Rep. Bruce Morris (D-140), District B chairman, asked about the process with that. “My understanding is the Board of Taxation has to vote, if this money is to be segregated,” Adams said. Once it’s segregated, the Common Council decides where it goes, Adams said. “I am bound by the agreement, I turn it over to the city, then the city has to figure it out,” Adams said. District B Vice Chairman Bobby Burgess asked if the money could help fund a new Community Action Agency for Norwalk. Burgess was founder of the now-defunct Norwalk Economic Opportunity Now (NEON). The $3.5 million figure is the equivalent of paying 20 years of the hotel’s taxes in advance, Adams said. That includes the personal property tax, on the furniture and other property that would have been in the hotel, and the real estate tax with the Enterprise Zone discount figured in, he said. Consultants said that the hotel would have generated $300,000 in taxes every year, and the first seven years of real estate tax would have been abated 50 percent, he said. Diane Lauricella asked why the city focused on hotel, office or residential as a mixed use component of the development, instead of a more creative institutional uses, like education space, a YMCA or a library. The SoNo Collection will feature 5,000 square feet of institutional use, probably a partnership with a museum and Norwalk Community College, Adams said. “It is our hope that the $3.5 million will foster those types of community assets,” Adams said. Asked about jobs, Adams said it is offering its first training classes this fall, in collaboration with Norwalk Community College. GGP is trying to set up pre-commitments from its retailers to give graduates of the classes a first chance to get a job. 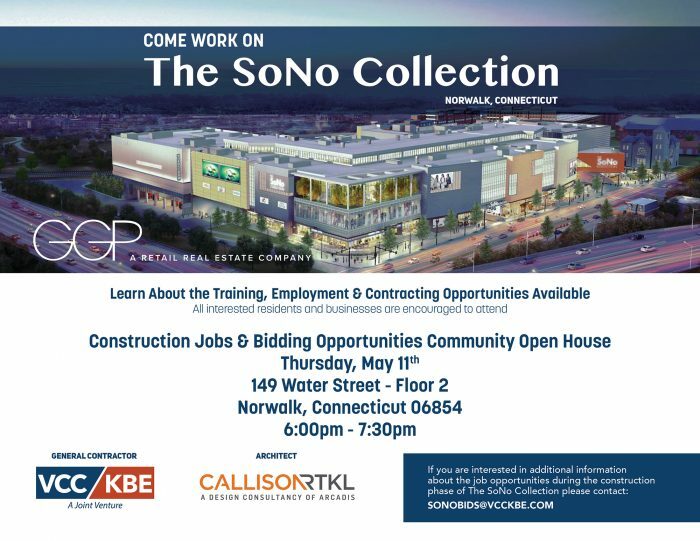 There was also a conversation about construction jobs; GGP is having a jobs and bidding community open house at 6 p.m. May 11 at 149 North Water St., Adams said. Burgess asked if the project is viable without the hotel as a draw. “The retail works fundamentally as a regional draw that brings people to Norwalk. We still heartedly believe in and that is why we are going to start construction,” Adams said. Reardon asked if a police substation is planned. “We put in a very state of the art security office. We do not typically have a police substation,” Adams said. GGP makes video feeds available to police departments; there are speakers in every tenant space so that announcements can be made; there are exercises with local emergency personnel to simulate problems, Adams said. Reardon mentioned that GGP is considering a store that rents outdoor power equipment as a possible tenant, and Adams did not disagree. “If the city has said no substation, no nothing, then clearly they haven’t looked at what happens at not just your mall but malls across the country. It would behoove us at this point to have a conversation as far as having some place in the mall for safety,” Reardon said. “The city has not said, ‘No, we are not going to have a substation.’ What we typically do is set aside some space for particularly the police, because they visit more frequently, where they can come and check in,” Adams said. In other GGP news, Ehlers, a Republican, who ran unsuccessfully for state senate last year and who has a business and financial services background, sent an email Monday morning alerting his mailing list to GGP’s quarterly report. NancyOnNorwalk sent him an email, asking if he thought the company is in serious financial trouble. “Today GGP executed what in legal world is called a MAC. Material adverse change. If you go on CNBC, WSJ you will see the company acknowledged all business decisions are under review. “I would be shocked if the contract for the mall in Norwalk does not include a provision if the company has a MAC. It protects the company and creditors from further liability. “Facilities for boys and girls”…..you mean schools? Why is it that schools never get an allocation from HUD or other monies? Shouldn’t basic infrastructure to cover a growing city, like police and fire stations, include monies for schools? Or does Urban Development only mean things like stalled apartment ($5 million gone at Poko) and theater (1.5 million about to vanish) projects? Use the 3.5mm to offset school construction, or general city infrastructure. No more programs, subsidized housing, etc. we need to stop spending every extra dollar the city receives on the entitlement class and start spending it on long term differed capital expenses. Which brings me to another point. If the mall is still in the GCP pipeline how are we considering the construction permit fees and available funds in this years budget? I have a relative who is a mall developer in Florida. She says, “it’s easier for developers to give money” than to embark on community enhancements themselves. They are aware of “soft costs” like environmental and engineering studies, and they have a better idea of how much things really cost to build. GGP execs know well that 3.5 million won’t get them very far. But to the average townie, 3.5 million seems like a boatload of cash. Her suggestion is to have the developers make the enhancements themselves–green space for yoga, pedestrian walkways, maybe a playground–to make this a pedestrian friendly walking type mall for the community instead of a leviathan off the freeway for everyone else. Bethesda, MD and Merrifield, VA both have malls that have been revitalized with an eye towards enhancing the local community. Just taking the 3.5 and the additional 500k for the circulator lets GGP off the hook. The City cannot negotiate the best possible deal for its citizens with GGP, then why imagine the City will know how to spend the 4 million dollars in giveback from the developer? When will Norwalk stop being a chump to developers? We have two Walmarts, a Costco, a Home Depot, a Best Buy, a P.C. Richards, and soon a BJs. And I’m probably forgetting a few. As far as allowing a change in the language of the LDA to redefine “high end retail” in include “high end entertainment concepts”, this is the road to ruin. A gym or a grocery store or theatre complex will cannibalizes local businesses. And there are no guarantees on tax revenue to the city from a high end entertainment concept (whatever that is). The anchors more than likely signed 25 year commitment contracts with GGP. But GGP is not extending that commitment to Norwalk. Their flagship mall in Providence had Lord & Taylor as an anchor. Then J.C. Penny’s replaced it. Now Penny’s has left, and GGP is converting the space to additional parking. I have no idea how much revenue GGP projects it will generate with parking, but it’s obviously a big number. Parking is cheap to build, requires almost no one to staff with automated services, and is basically a license to print money. Whoever is negotiating this deal with GGP should leverage the loss of the hotel against some cut of the parking revenues. So did anyone respond to this question? Or was she simply ignored? “High-end entertainment concepts” = Fancy upscale striptease clubs maybe? $3.5 mil is going to be needed for the upcoming election. “Others questioned the eventual outcome of the $3.5 million GGP has agreed to pay Norwalk, should the city, through the Common Council, the Redevelopment Agency and the Zoning Commission, agree to let GGP build its mall without a hotel. There is no water on that plot of land but wow, what a swamp. This plot gets uglier and uglier by the day and get the impression very few in charge know where this is going to end up. $3.5m in pork though for someone to size up. Unreal. And do Diane L – we had a YMCA about 200 yards down the road and it closed; library? 1/4 mile down the road but the geniuses skipped on any parking plan and now the library remains in a jam. What a mess and if I’m GGP, CT would be the last place I’d put a shovel in the ground. Fork? Yes. Shovel? No. Put BOLD letters on what Kevin said.